With what many have described as a flash of monetary discipline worthy of Paul Volcker, Ben Bernanke reduced short-term interest rates this week to a mere 2%, apparently turning a deaf ear to those on Wall Street who wanted more. But now that the dollar-crushing side effects of cheap money are widely understood, there is, in reality, little pressure remaining for steely-eyed Ben to resist. Excuse me, but I knew Paul Volcker. 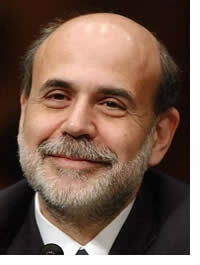 Paul Volcker was a friend of mine (well, not really), and Ben Bernanke is no Paul Volcker. The dominant spin that bubbled up after the Fed statement held that since no more rate cuts were hinted at, the Fed has effectively sounded the economic all clear, and that its attention would now shift to inflation and the weak dollar. As a result, the dollar rallied and gold, oil, and other commodities fell sharply. Even if the Fed has really paused (which the statement does not necessarily suggest), a 2% Fed funds rate is still ridiculously low. Given that even the official measures of inflation are well above that level, to say nothing of the actual rate, how can anyone believe that current policy will engender a strong dollar? To restore real strength to the greenback the Fed would have to raise rates substantially, something they are very unlikely to do. Although some marvel at our economy's resilience, given how much of this strength is a function of leverage and debt, high interest rates are the economic equivalent of kryptonite. In other words, it's the ultimate Catch-22. Unlike when Paul Volcker came to town, there is now nothing the Fed can do to prevent the dollar from falling. While the Fed may pay lip service to being vigilant on inflation, their actions suggest otherwise. Before the ink on their supposedly hawkish statement had dried, the Fed announced additional measures to supply even more liquidly (create more inflation) by expanding its term auction facilities and allowing bonds backed by student, auto and credit card loans to be pledged as collateral. The Fed continues to claim that should inflation not come down as it currently forecasts, it would then stand ready to act aggressively. However, that is exactly what the Fed has been saying for at least the last five years. By emphasizing how core inflation remains controlled, the Fed continues to thumb its nose at consumers struggling with spiraling food and energy costs. Despite years of busted forecasts, its confidence in lower inflation is once again based on its belief that commodity prices have peaked. They haven't. No matter how often the Fed cries wolf, it somehow manages to maintain credibility. In reality, the fundamentals for the U.S. dollar have never been worse and we are as close to an outright dollar crises as we have ever been. Those looking for a reversal in the dollar's trajectory, or like our friend Larry Ludlow states, a return to "King Dollar", are living in a fairy tale. In fact, just yesterday the name "Goldilocks" made a number of appearances on CNBC. The consensus on Wall Street seems to be that high commodity prices mainly result from speculation, much of it tied to the weak dollar. Now that the dollar is expected to strengthen, those traders naturally believe that commodities will lose their appeal. In fact, yesterday CNBC's Erin Burnett stated that oil prices no longer trade on fundamentals, but simply on movements in the dollar. Pardon me Mrs. Burnett, but nothing is more fundamental to the price of oil, or of anything for that matter, than the value of the dollar. For all of the talk about speculators driving commodity prices, for once Wall Street may be right. Speculators are now driving the market, but it's the shorts that are behind the wheel. In contrast, the underlying bull market in commodities has always been driven by the fundamentals, including of course the most inflationary monetary policy in world history. Sure some speculators have gone along for the ride, but they have clearly been riding in the back seat. However, the most recent correction is being driven by speculators who, lacking any real understanding of the fundamentals, are trying to profit from what they wrongly believe to be the bursting of a bubble. However, once the shorts have piled on, look out, as the next rally will be spectacular. Not only will it be driven by real physical and investment demand, but by the mother of all short-covering. Got gold? For a more in depth analysis of the inherent dangers facing the U.S. economy and the implications for U.S. dollar denominated investments, read my new book “Crash Proof: How to Profit from the Coming Economic Collapse.” Click here to order a copy today. Well we can also say this. Barnanke does have the support Volcker had. 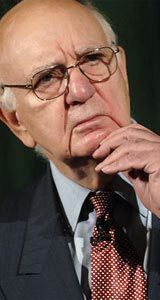 At least Volcker had a small business, citizen entreprenuer base to offset the the poor decisions on Wall Street. A little more support from the lushes in D.C. could be argued. Let the small business trade their goods in gold and silver and this mess ends with a lot less pain.